When you join the military, or become a military spouse one thing you learn pretty quick is that you will always be making connections at each new assignment. Even when you make friends at one location you know a move is on the horizon and sometimes friends leave before you and you lose those connections. And some days you may feel like giving up. You look at the calendar on the wall and wonder is it even worth trying. You know a new assignment will be coming soon. Is it even worth investing or giving yourself again? Each time you move to a new assignment you have a list of to dos. Find a new house, new town, new streets, new stores, new everything. And again, you will see finding new friends is on the list, again. Some of the new stuff is good and easier to adjust to, I mean you have to eat so finding a place to buy groceries doesn’t take a lot of effort. But finding new friends and making deep connections will take time. And it will also take effort and it may even take you going first. From my experience of transitioning from military member to military spouse, it felt a lot harder to get connected after we moved. But I also have made deeper connections here than I have before. Probably because here I created a village that I needed and depended on. At work, I was handed instant connections and a basic support network. I took those connections for granted. Not realizing what a gift I was given. I spent my last year in Ohio wondering where my village was and trying to build those connections before it was time to move again. When I got to LA, I was desperate for friendship and connection. So, I dove in and it paid off after a few short months. I joined a local YMCA and started attending classes daily and soon signed my young son up for weekly classes as well. Once the summer was over I joined a Bible study. The first Bible Study was women at a very different life stage, but I didn’t know where to go next. Someone suggested Mothers of Preschoolers and by the time I tried to join childcare was full. By chance I met a lady at the YMCA who attended my new church and had a daughter a month older than my son. It was the connection I needed. And I left my current Bible Study and joined hers. I found my people. But it still took time. Play dates, birthday parties, girls weekends and long runs got me connected to my people. It took reaching out and going out and saying yes. Some of it was luck, some of it was being willing to be vulnerable. When you move somewhere new sometimes it feels like everyone has it all together. That everyone has their friends lined up and there isn’t room for you. Do not believe that lie. There is always room for you. There is always room for one more friend. We all crave connection and to feel loved. Does this mean everyone will be your best friend? No, but if you put yourself out there you will likely find that one person. 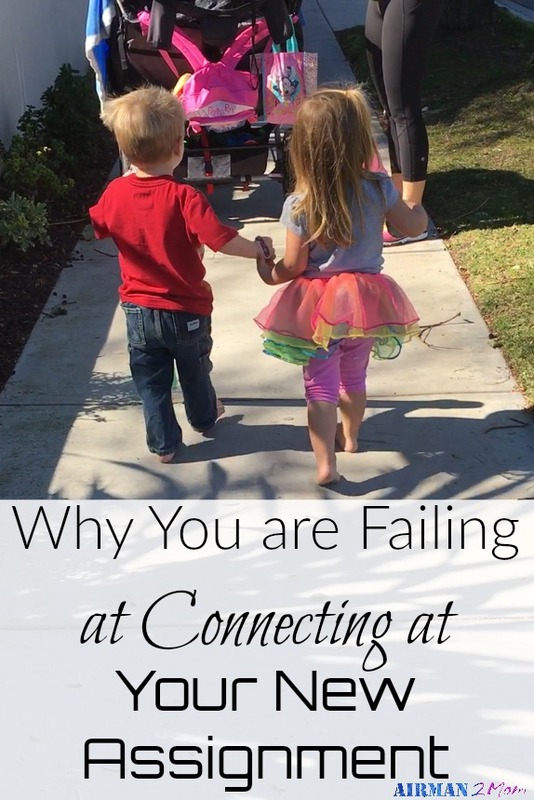 Maybe you will connect over something silly like a TV show you both love or maybe your kids will bring you together. It does not really matter what it is. The important thing is that you are open and ready. And willing to invest. When you dig deep and give of yourself you will get so much back in return. How do you get connected at your new assignment? This is so great Amanda! I Have had the hardest time moving as a military spouse even though I’ve been moving literally my whole life. I’m going to have a plan for our next move even though having older kids will help. No big tips- just get out there and do it! Thanks Jen. It is really hard. And yes you do just have to get out there and do it.